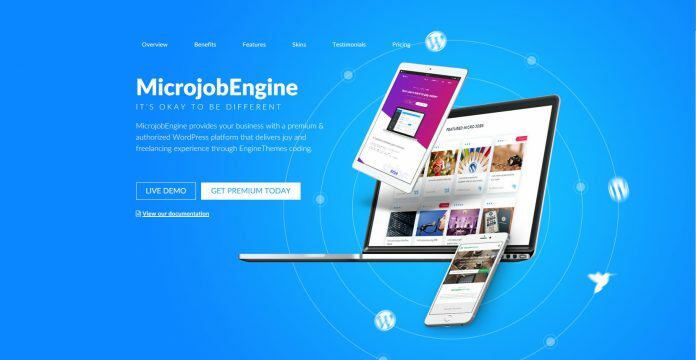 MicrojobEngine by EngineThemes is a fully functional microjob marketplace WordPress theme. By using MicrojobEngine, you can set up your own online marketplace job board portal similar to Fiverr within minutes! For an online entrepreneur who wishes to create a Fiverr type website, WordPress is the answer. WordPress have evolved from just a CMS to so much more. Today, WordPress is frequently used as an application framework and powers web applications. Technically, you can even use WordPress as a backbone for mobile applications. Therefore, a growing number of developers are building functional turnkey web apps into WordPress themes or Plugins. When choosing a solution for a marketplace website, you will need to consider your business requirements and user experience. Fortunately, the development team from EngineThemes has already studied the business model and developed a fully featured, well thought WordPress theme. MicrojobEngine features a clean, modern design that is focused on optimal user experience. With only a single click of the menu or search, a buyer can find the services he requires. 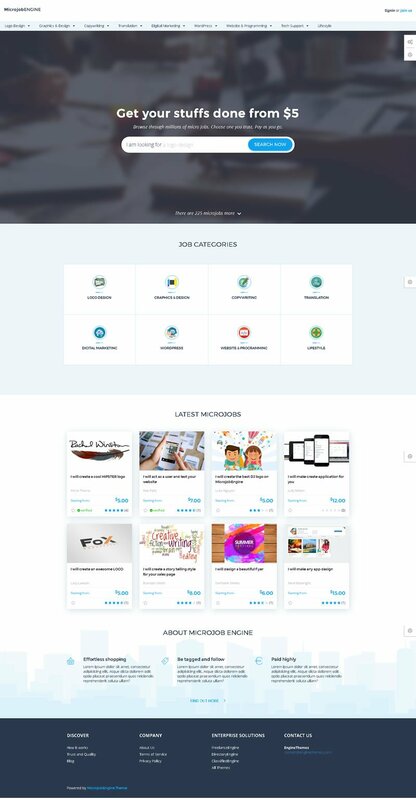 On the front end, visitors can search or browse jobs categories to find the most suitable freelancer, developer or designer that best meet their project requirements. You can set up any category you wish, depending on you website niche. Most common services would include Graphic Design, WordPress Installation, Copy writing and Programming Services. To aid with their decision, a reviews & ratings system is built-in so that buyers can leave reviews & ratings for each seller. Each seller pays for a plan that includes the number of postings that he/she can make and each seller will have access to a profile page with a short bio and the ability to customize add on services. A customized and interactive user dashboard handles everything including orders, jobs, revenues, withdrawal, analytics and messages in one page. A direct chat box feature allows for buyers and sellers to communicate via private messages without leaving the site. Therefore allowing for direct communication for negotiation and discussion.